Sometimes, the inspiration well simply runs dry. What will you blog about today? If you want your content to be shareable, you need to make sure that it’s as fresh and high quality as it can be. Offering something new is part of that. But how can you come up with new things to say on your blog day in and day out? Here are five FREE Google tools mind stays inspired and your blog stays full of new content. In order to create content, you need to consume it. You should monitor the content from competitors and other go-to industry blogs that will keep you up to speed about the trends in your industry. This will give you a sense of what’s already being covered and serve as inspiration for how you can offer a different or fresh take to your readers. You can use the Google Chrome RSS Subscription Extension to find the RSS feed for whatever blog you are reading without leaving the page. Firefox has a similar offering with the RSS Icon Add-On, which also shows a RSS icon in Firefox’s address bar. Organization tip: Collect your RSS feeds into categories and put them into folders. Do this by clicking “Feed Settings” and selecting a current folder or creating a new one. Next, let Google Reader guide you to finding new feeds. Discover similar content by clicking the arrow on the feed itself. There’s a ton of news to keep up with. 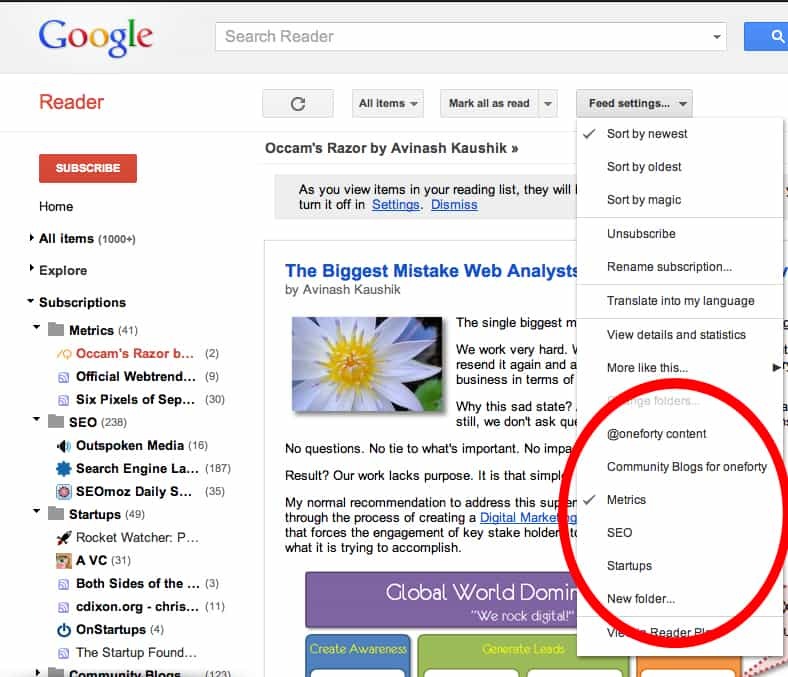 Setting up and organizing your RSS feeds in Google Reader will make that process much more manageable and enjoyable. RSS feeds aren’t just for blogs. You can subscribe to RSS feeds of Twitter searches, LinkedIn Answers and even Quora threads. Again, keeping the feeds organized is key to staying motivated to actually read them though. Add your RSS feeds to a single iGoogle dashboard for a DIY social media monitoring dashboard. To do this click “Add Gadgets” at the top left hand corner of iGoogle, and then add the RSS feed of your choice on the next page. You can drag and drop your gadgets around the dashboard to organize them in the most efficient way you can. Chrome is Google’s own web browser, and Shareaholic offers several Chrome plugins that will make your life easier. For your blog post idea generation needs, if you find a blog post that sparks inspiration for you, email it to yourself with the Shareaholic Chrome plugin. This is particularly helpful if you’re working with a team of writers. Find a great topic? Email it to the group. Add Gmail to your services under Accounts/Services. When you find an article you want to email to yourself, click on your Shareaholic icon in the corner. It will open your email in a new tab so you can send away. 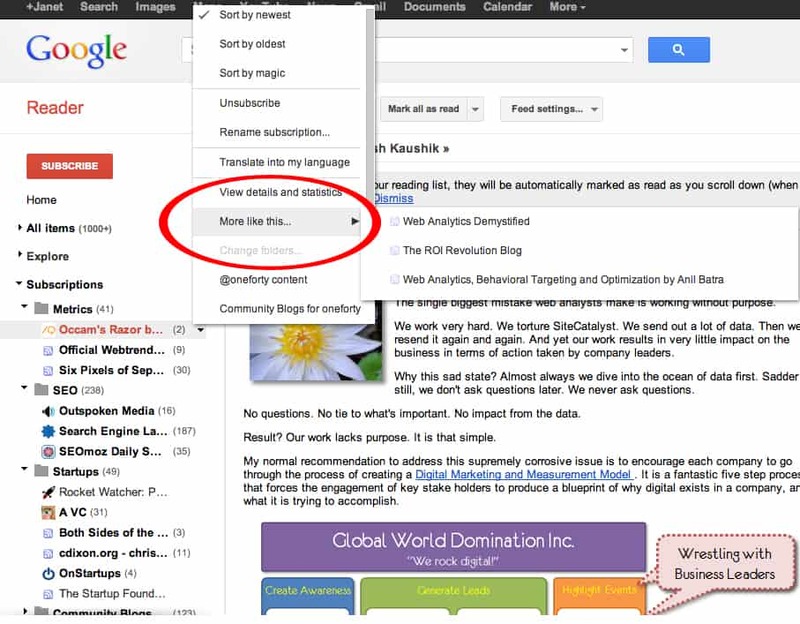 Bonus points: collect the articles you like in a Gmail folder to keep your content consumption manageable. What keywords are sending your blog traffic? Leverage that traffic with blog posts that target those keywords. 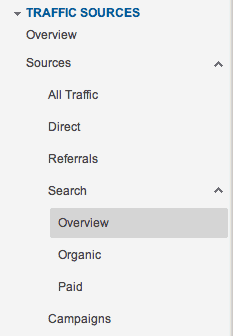 Discover them in Google Analytics under Traffic Sources/Overview. Find variations of these phrases using Google’s free keyword research tool. Now that you’ve identified some topics and keywords you want to target, collecting these thoughts into a plan of attack will lead you to blogging success. Creating a content publishing schedule is extra motivating for getting blog posts out. It’s almost like you’re creating a delicious menu of strategic ideas to pull from for your next blog post. The free spreadsheet you can create in Google Docs is a perfect platform for it. For a backstage view, here’s how I keep things organized for the Shareaholic blog. Another nice thing about Google docs is that you can share them easily with other writers. Ah, the beauty of the cloud. One more Google docs tip: If you put in the work to establish an editorial calendar, you don’t want to lose your work. Use Backupify to back up your Google docs. What tools do you use to generate blog post ideas? Let us know in the comments. Need even more help getting blog post ideas? Here are 20 to get you started.